Iran exported 3.6 million tons of commodity polymers in 2018, down 5% from the prior year. Imports were 198,000 tons, down 42%. Shipments of fabricated plastic products jumped 35%, to 224,000 tons. Polyethylene was by far Iran’s largest polymer export, 3.1 million tons, down 4%. Nearly 80% of this went to China, another 7% to Turkey. 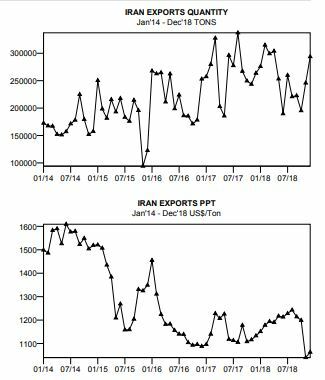 Polyethylene shipments climbed in November and December of 2018, but there was a sudden drop in the average price, by over $200/ton, as new US sanctions on Iran took effect. The graphs show the monthly trend in Iran’s polyethylene exports and average price. Styrenic polymers were Iran’s next largest and the fastest growing export, 216,000 tons, up 70%. China and Turkey were also leading destinations, followed by Iraq. Exports of polypropylene and PVC were each under 200,000 tons and declined from the prior year. Relatively small volumes were imported into Iran. Polyethylene and polypropylene comprised three-fourths of the 198,000 tons total, both sourced mainly from Asia-Pacific. Iran substantially expanded its exports of film/sheet and bags/sacks made from polyethylene and polypropylene. The Middle East (primarily Iraq) was the largest export destination, followed by Asia-Pacific. From International Trader Publications’ 2018 Iran Polymer Trade Report, a 50 page publication analyzing Iran’s trade in commodity polymers, recycle polymers and fabricated plastic products. This entry was posted in Trade Trends and tagged Asia-Pacific, China, Iran, Iraq, Middle East, PE film/sheet, Polyethylene, polypropylene, PP film/sheet, PVC, styrenic polymers, Turkey on February 12, 2019 by JJSUDOL.